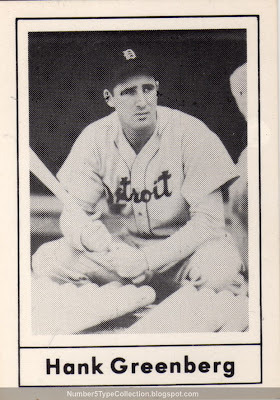 Hank Greenberg's on the short list of classic players I'd love to have seen in person. At least those of us who came after can watch the eponymous 2001 documentary, "The Life and Times of Hank Greenberg." (Details at http://www.hankgreenbergfilm.org/.) Today's card catches him in a nicely pensive pose. Wallin followed these up with a similar set of "Diamond Greats" in 1979. He saved some costs by dropping the player bio, adding a career stat line to the front, and using a blank back. This blog profiled its #5, Yankee HOFer Joe Sewell, in 2008. Want to see more cards from this set? Check out the dedicated blog at Grand Slam 1978! 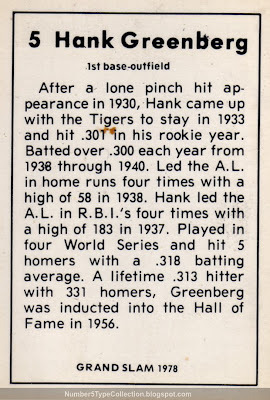 The intro post has plenty of production notes and its #5 post talks in detail about Hank Greenberg as a player and symbol. 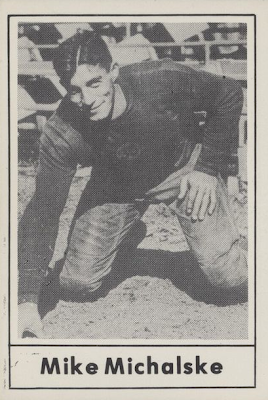 UPDATE: Jack Wallin published a similar set of famous football players called Touchdown Club. Here's the #5, Mike Michalske. A near-set of signed cards sold for over $1700 in May 2011. Value: This Hank cost me $6 on eBay in 2005, about right for a high-grade single. They're pretty hard to find, but demand isn't particularly high for the set as a whole. Fakes / Reprints: As a collector-targeted issue, I doubt anyone reprinted these cards. Since the set specifically encourages signature hunting, however, be aware of faked autographs on real cards! Thanks for the link to my blog. The Grand Slam set is my favorite oddball set.